Included: Tour to Tiwanaku (touristic transport, tour guide, entrance fee, lunch) + hotel. Around MID-DAY – Arrival to Copacabana (approximate arrival) with accommodation in the selected hotel. Included: Touristic bus from La Paz – Copacabana, lunch, tour to the Island of the Sun (boat, tour guide, entrance fees) + hotel in Copacabana or hostel on the Island of the Sun. NOTE: For all programs/services that involve Copacabana as a destination, it is important to make sure that you take with you your passport (which includes your entrance stamp into the country); there is a control post in the area where you may need to show this information. DAY 04.- VISIT TO COPACABANA + PM BUS COPACABANA à LA PAZ. 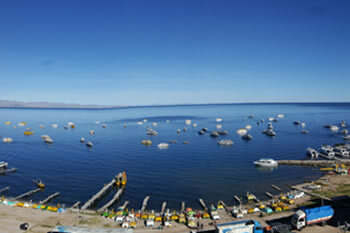 13:30 PM – After lunch around mid-day, we will take the touristic bus back to La Paz. 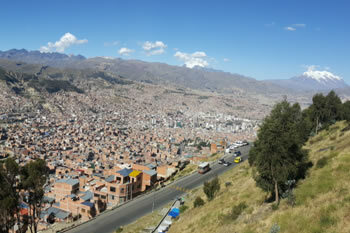 17:00 PM – Arrival to La Paz (approximate arrival). Included: Visit to Copacabana, lunch, touristic bus from Copacabana – La Paz + hotel. We'll be visiting: the Plaza Murillo, the Holy Cathedral, the Government Palace, the San Francisco Church, Mirador Quilli Quilli - where you can grasp a beautiful view of the entire city, the Museum of Gold or Costumbrista, and the Witches Market, in which the local people buy various necessities for the many ritualistic ceremonies in existence in Bolivia - including the ceremonies of Ch'alla and the offerings to Pachamama - "Mother Earth." AFTERNOON – We will return to Uyuni and find accommodation in the selected hotel. HOTEL IN UYUNI: Provides a hotel room with private bathroom + breakfast. Included: Shared transport (4x4 Jeep – Land Cruiser), breakfast and lunch + hotel. AM – After breakfast in the hotel and at the indicated hour, there will be a transfer to the Uyuni bus terminal. 10:00 AM – We will take the local bus from Uyuni – Potosí (approximately a 4-hour trip). 14:00 PM – Arrival to Potosí (approximate arrival) and then accommodation in the selected hotel; you will have the afternoon free on your own account. HOTEL IN POTOSÍ: Provides a hotel room with private bathroom + breakfast. 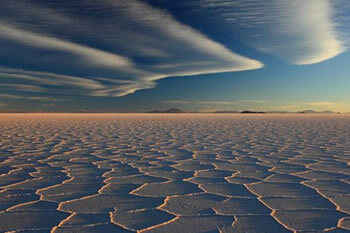 Included: Transfer out/in, local bus ticket from Uyuni – Potosí + hotel. 08:40 AM – Personal pickup from your hotel in Potosí to start our interesting trip to the silver mines of Cerro Rico in Potosí. The trip will begin with a visit to the Miners Market where hundreds of miners gather to provide material or equipment necessary for work in the mines – like dynamite, ammonium nitrate, detonators, carbide lamps, equipment to drill holes, coca leaves, and spirits; all visitors are allowed to take pictures of the shops and the market, and visitors can even acquire presents or souvenirs. After visiting the market, we will visit the ingenuity mineral refinery which has been active for many years – and, then we will continue on our way to the silver mines where we will observe the strong work of the miners extracting the minerals by hand like in past centuries. Without a doubt, the Currency Museum is the most important building in the history of South America’s colonial architecture – its architect/builder was a man by the name of Don Salvador de Villa who had planned and constructed the Currency Museums in Mexico and in Lima, Peru. Interestingly enough, the construction of the museum in Potosí surprisingly came into fruition because much silver was found and extracted from Cerro Rico. Included: Tour to the Silver Mines (shared transport, tour guide, equipment to visit the mines – jacket, pants, helmet, and headlamps), visit to the currency museum + hotel. AM – After breakfast in the hotel and at the indicated hour, there will be a transfer to the Potosí bus terminal. 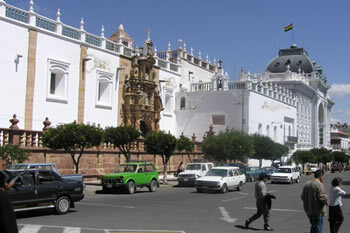 AM – We will take transportation from Potosí – Sucre (approximately a 3-hour trip). AM/PM – Arrival to Sucre (approximate arrival) and then accommodation in the selected hotel. AFTERNOON – You will have the afternoon free on your own account to enjoy the beautiful city. HOTEL IN SUCRE: Provides a hotel room with private bathroom + breakfast. Included: Transfer out/in, shared transport from Potosí – Sucre + hotel. AM – After breakfast, you will be personally picked up from your hotel to take a ride through the city where we will be able to visit in the afternoon the Dinosaur Park – located in Cal Orck’o (Hill of Cal in English), 6 kilometers from the city. The city of Sucre (known as the White City due to the preservation of the majority of its buildings) is without a doubt one of the most beautiful in all of South America with a historical center that still maintains the colonial architecture of past centuries; the entire city is a small taste of heaven because the buildings are covered in white. During the city tour, we will visit the charming streets and important places where transcendental works within the pivotal history of Bolivia and all of the Americas have been accomplished; within the streets and important places, one can feel welcomed by the aura and beauty expressed by the neoclassical facades and the magnificent colonial churches – as well as the principal historical monuments. At the park, you will have the opportunity to appreciate a large variety and quantity of different pre-historical animal species, considered to be the greatest showing of dinosaur footprints in the entire world; studies propose that these footprints were from pre-historic animals which lived in the zone more than 65-70 million years ago. Included: City Tour in Sucre + Visit to the Dinosaur Park (shared transport, tour guide, entrance fees) + hotel. AM – After breakfast in the hotel, we will personally pick you up from your hotel and then transport you to the Sucre airport. AM – 45-minute flight from Sucre – La Paz. AM – Arrival to the La Paz airport (approximate arrival) and then transport to the selected hotel. Upon arrival, you will have the afternoon free on your own account. Included: Transfer out/in, flight ticket from Sucre – La Paz + hotel. AM/PM – At the indicated hour, we will personally pick you up from your hotel and then transport you to the La Paz airport. Included: Transfer out à La Paz airport.